All transactions are safe and secure with a reliable history in online purchasing behind each of our associates. 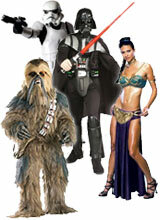 Buy the Star Wars Chewbacca Costume, Storm Trooper and Darth Vader Costumes to own Star Wars clothing and merchandise. Browse a selection of Star Wars costumes that range from classic characters like Darth Vader, Princess Leia, Yoda, Chewbacca, Han Solo and Storm Troopers to newer character outfits like Jango Fett, Queen Amidala and Clone Wars costumes. Get noticed in the Jabba the Hutt outfit or lurk in the shadows in the Jawa disguise. Add a replica lightsaber to truly light up your costume. Options vary in price depending on the quality of the galactic disguise that you choose. In addition to the Star Wars Chewbacca Costume, Storm Trooper and Darth Vader Costumes above, browse the Star Wars Clothing Gallery for more apparel like men's and women's clothes, kids shirts or hoodies.